Eastern Oregon Film Festival is calling for your participation. EOFF is an artist-run film festival in La Grande that features three days of the best in emerging independent film and music. Mark your calendar, hydrate, and meet us in downtown La Grande for our FIFTH ANNUAL celebration FEBRUARY 20-22, 2014. Sign up for email alerts, share stuff, tweet, get psyched! Are you looking to get thousands of eyeballs on your brand? Do you get a kick out of supporting the community? EOFF is a 501c3 and your contribution may be tax-deductible. Not a member yet? Well, you could be—and that would be sweet! Check out our packages online to see what suits for your festival needs. Early bird festival passes available in January. EOFF + LA GRANDE MAINSTREET’S HALLOWEEEEEEN! Last Thursday, EOFF volunteers Scott, Brant, and Glen survived hordes of zombies, vampires, mermaids, and ninjas during the Halloween festivities in downtown La Grande. Waving the festival flag, the trio made some new friends and passed out bags of candy, spreading word of #EOFF2014. The guys also had ParaNorman looping on a flat screen, and local youth instantly recognized the film—recalling LAIKA’s visit from last year, which included a hands-on demo and screening of The Making of ParaNorman. As with the festival event, there were lots of smiles and healthy discussion of puppetry—it was cool. EOFF is proud to be a recipient of a Meyer Memorial Trust Grassroots Grant. The award of $10,500.00 will be used to strengthen the festival and assist with capacity building and venue enhancements. MMT works with and invests in organizations, communities, ideas and efforts that contribute to a flourishing and equitable Oregon. (October 30) EOFF hosted visiting artistsWooden Indian Burial Ground (Portland, OR) and Couches (San Fransisco, CA) along with local band Catskills at Benchwarmer’s Pub & Grill to officially kick off the Save the Date campaign for #EOFF2014. Board members and volunteers were on hand, passing out postcards and getting people psyched for the festival. The music was incredible and a lot of wonderful folks came out to listen to music and support our little festival. You people rule—THANK YOU! EOFF would like to welcome Leah Over and Glen Scheele to the board. These two individuals have put a lot into our community over the years and we are excited to have some new blood pumping in the organization. Additionally, EOFF would like to thank Charles Jones for stepping into our Volunteer Coordinator position! 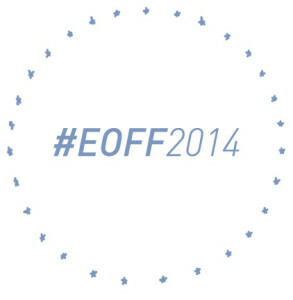 #EOFF2014 is coming in hot!